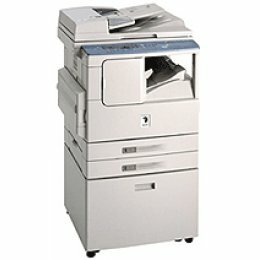 Operating at 16 pages-per-minute, the imageRUNNER 1600 comes equipped with many productivity enhancing features, such as Scan Once Print Many, Copy Reservation, Two-Page Separation, Image Combination and superior quality output equivalent to 1200 dpi x 600 dpi for copying and an impressive 2400 dpi x 600 dpi for printing. This amazing device comes standard with a 250-sheet front loading cassette and a 100-sheet bypass. Other options and features include the flexibility to support a maximum paper capacity of 1,100 sheets, 32MB or 64MB printer memory upgrades, an Ethernet Network option, and an optional 10G Hard Drive for enhanced printer functionality. In addition, two convenient finishing options are offered - an inner 2-way tray ensuring output of prints and copies are not mixed, and an internal finisher that offers offset stapling and sorting.